Hon. 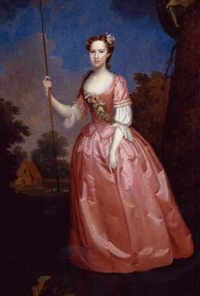 Frances Ingram-Shepheard was born in 1761. 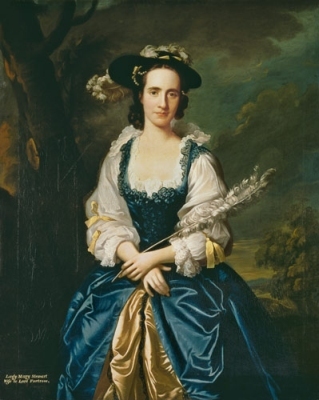 She was the daughter of Charles Ingram, 9th Viscount Irvine and Frances Shepheard.1,3 She married Lord William Gordon, son of Cosmo George Gordon, 3rd Duke of Gordon and Lady Catherine Gordon, on 1 March 1781.1 She died in 1841. [S6] G.E. Cokayne; with Vicary Gibbs, H.A. Doubleday, Geoffrey H. White, Duncan Warrand and Lord Howard de Walden, editors, The Complete Peerage of England, Scotland, Ireland, Great Britain and the United Kingdom, Extant, Extinct or Dormant, new ed., 13 volumes in 14 (1910-1959; reprint in 6 volumes, Gloucester, U.K.: Alan Sutton Publishing, 2000), volume VII, page 75. Hereinafter cited as The Complete Peerage. He succeeded as the 3rd Baronet Maxwell, of Monreith, co. Wigtown [N.S., 1681] on 23 May 1730.4 He lived at Monreith, Wigtownshire, ScotlandG. [S15] George Edward Cokayne, editor, The Complete Baronetage, 5 volumes (no date (c. 1900); reprint, Gloucester, U.K.: Alan Sutton Publishing, 1983), volume IV, page 311. Hereinafter cited as The Complete Baronetage. [S1577] Hugh Mark, "re: Agnew Family," e-mail message to Darryl Roger Lundy, 19 January 2006. Hereinafter cited as "re: Agnew Family." 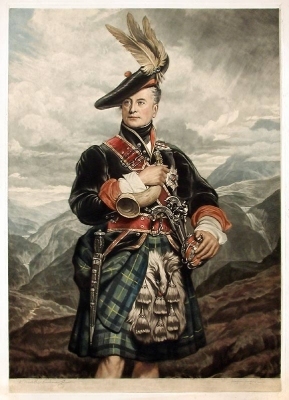 General George Gordon, 5th Duke of Gordon was born on 2 February 1770 at Edinburgh, Midlothian, ScotlandG.3 He was the son of Alexander Gordon, 4th Duke of Gordon and Jane Maxwell.1 General George Gordon, 5th Duke of Gordon filed for divorce from an unknown person at Eton College, Windsor, Berkshire, EnglandG.1 He married Elizabeth Brodie, daughter of Alexander Brodie and Elizabeth Margaret Wemyss, on 11 December 1813.1 He died on 28 May 1836 at age 66, without legitimate issue. [S2055] Ken Hosking, "re: Gordon Family," e-mail message to Darryl Roger Lundy, 13 January 2007. Hereinafter cited as "re: Gordon Family." Her married name became Gordon. 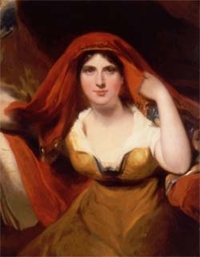 After her marriage, Elizabeth Brodie was styled as Duchess of Gordon on 17 June 1827. [S6] G.E. Cokayne; with Vicary Gibbs, H.A. Doubleday, Geoffrey H. White, Duncan Warrand and Lord Howard de Walden, editors, The Complete Peerage of England, Scotland, Ireland, Great Britain and the United Kingdom, Extant, Extinct or Dormant, new ed., 13 volumes in 14 (1910-1959; reprint in 6 volumes, Gloucester, U.K.: Alan Sutton Publishing, 2000), volume VII, page 299. Hereinafter cited as The Complete Peerage. [S2156] Jennifer Browne, "re: Browne Family," e-mail message to Darryl Roger Lundy, 18 February 2007. Hereinafter cited as "re: Browne Family." [S6] G.E. Cokayne; with Vicary Gibbs, H.A. Doubleday, Geoffrey H. White, Duncan Warrand and Lord Howard de Walden, editors, The Complete Peerage of England, Scotland, Ireland, Great Britain and the United Kingdom, Extant, Extinct or Dormant, new ed., 13 volumes in 14 (1910-1959; reprint in 6 volumes, Gloucester, U.K.: Alan Sutton Publishing, 2000), volume I, page 123. Hereinafter cited as The Complete Peerage. [S15] George Edward Cokayne, editor, The Complete Baronetage, 5 volumes (no date (c. 1900); reprint, Gloucester, U.K.: Alan Sutton Publishing, 1983), volume V, page 19. Hereinafter cited as The Complete Baronetage. [S229] Burke John and John Bernard Burke, A Genealogical and Heraldic History of the Extinct and Dormant Baronetcies of England (1841, reprint; Baltimore, Maryland, USA: Genealogical Publishing Company, 1985), page 130. Hereinafter cited as Extinct and Dormant Baronetcies of England.